Looking at models of the body’s organs or the skeletal system and practicing CPR on a manikin can help students to use visuals to better understand the parts and functions of the body. If you want to take this experience to another whole dimension use virtual reality technology. 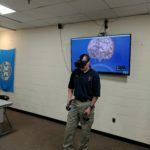 UTC has equipped the Public Safety and Health Occupations classrooms with a VR system. We are using software produced by Sharecare. By utilizing virtual, augmented and mixed reality, Sharecare is leading the visual health revolution, empowering people at all points in the healthcare ecosystem to better communicate and understand medical diagnoses, treatments and patient journeys. Journey inside the body and watch the heart function. Journey inside the heart and see the valves operate, examine the flow of blood leaving the heart and returning to be oxygenated. Examine how tissue becomes calcified and see how it affects the heart’s function. This VR experience has students and teachers engaged in a learning opportunity that few academic institutes in the state have been exposed to. UTC students can take advantage of this outstanding technology to journey in to the systems and organs in the body. It has taken their learning to a whole new level. Instructor Ryan Carey demonstrates the new VR technology in Public Safety class.